Higham is situated in the Borough of Pendle in East Lancashire, on the south side of Pendle Hill, between the towns of Nelson and Padiham. Over the years Higham has changed from an agricultural village into an industrial village and now is largely a commuter village. In Roman times, Higham occupied a position midway between the Roman camp at Ribchester and the Roman colony at Colne. An old Roman road, now a country lane, runs along the top of the village, but was once the 'Highway of the Legions'. During Norman times, most of the land now known as Pendle Forest, was uncultivated land and available for hunting. Originally called Pendle Chase, it came into the possession of the De Lacy family. Gradually the severity of the Norman regime was relaxed. After the De Lacy estates had passed by marriage in 1311, to Thomas, Earl of Lancaster, Pendle Chase became subject to the laws of the Forest of Lancaster. A notable building in Higham is the manor house, Higham Hall, built in 1327, where the Halmote Court was held twice a year, in April and October. The De Lacy's would send a representative from Clitheroe Castle to receive payment from the leaseholders in the Pendle Forest. The farmers would pay a rent of a few shillings, whilst the cottagers would pay 1d as the Duke's rent. The records also show records of disputes about boundaries, changes of ownership, and fines for breaking hedges, blocking up roads and leaving gates open. A jury would be summoned to consider cases of property transfers. 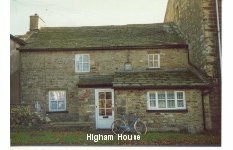 If rent was in arrears, fines would be imposed, and there was a gaol at Higham House, one the oldest buildings still standing in the village. Higham Hall was found to be unsuitable for the court around the middle of the 19th Century, so it was transferred to the Four Alls Inn. The Halmote Court, though shorn of its old powers, continued to be held in Higham until the early 20th century. There are place names connected with horses e.g. Hunterholme and Dame Fold. In the 14th century, there was thought to be a horse breeding establishment owned by the King's representative, which bred horses for the Black Prince. By the 14th century, enclosures were introduced into the Chase for cattle pastures. These were called VACCARIES (tall standing stones as separation). Farm buildings were called BOOTHS (West Close, Higham, Laund). Charges were made for grazing 4d for oxen, 2d for sheep. Apart from pasturage, the area was unproductive. By the 15th century in Pendle Forest, farming became more important than hunting and deer were enclosed ( Fence ). Henry VII deforested the area to make it more profitable. All the vaccaries were leased out with an increase in rents of 50%, but the tenants had the security of their farms. An area in Higham is the site of a PINFOLD or POUNDFIELD which was a pound in which stray animals are kept. Pinfolds go back 500 years, maybe even more. It was enclosed by a high wall and had fresh grass with a water supply running through it. There was a doorway, which once the animals were placed in the Pinfold, was secured and a special piece of wood was then taken by the Pindar, who was an official of the court, responsible for the Pinfold. The owner of the animals, when claiming them had to pay a fine before he could take the animals away. 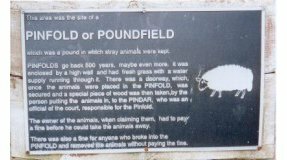 There was also a fine for anyone who broke into the Pinfold and removed the animals without paying the fine. In the 17th century, farming was the chief occupation but there were other domestic industries and crafts. Even at this time the textile industry played a part in the economic life. Among mills and inventories were mentioned millers, masons, blacksmiths, butcher, shoemakers, clothiers and weavers. The inventories showed that they were farmers as well. Many of the small and medium farms were run solely by family labour. Several sons and daughters were kept fully employed using the spinning wheels and looms. In ¾ of households, wool and flax was carded, combed and spun. The inventions of the late 18th century, and the introduction of power looms meant the golden age of the handloom did not last long, for the new factories could weave faster and cheaper than the handloom weaver. The worst period for the handloom weaver was in 1826, when the weekly wage was reduced to 1/6d, after an income of 2/6d to 3/-d a week in 1822. 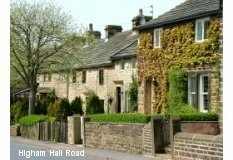 There is a diary written by William Varley, a handloom weaver, who lived in Back of the Hill, ( top of Sabden Road, in the Fold) Higham. It describes the poor living standards and the hatred and bitterness towards the mill owners. Some relief was brought to the village by the building of Fir Tree Mill in 1851 and Clover Croft Mill the following year. The 1851 census showed that the cottage industry was still the more prominent. However on the 1861 census, the power loom had well and truly taken over, as 126 persons are described as power loom weavers. 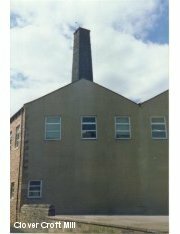 Higham had a shuttle works,( later a bobbin making factory) which was a water powered site established in the first half of the 19th Century. It was a two storey block, which is now a dwelling called Clough Mill. Fir Trees Mill was a small weaving shed built in 1851 with 138 looms. Workers lived in terraced houses built for them on Laneside. By 1860 it had 200 looms. It was modernised in the 1950s, closed in 1965 and sold to Wareprod Engineering. It was eventually demolished in the 1980s and the site used for housing. Clover Croft Mill was built in 1852 with 400 looms. By the late 1870s, it had a workforce of 150. It was extended in 1906 to have 600 looms. Cheaper foreign imports forced its closure in 1962. The business was taken over and became part of Viyella. In 1969 Cloverbrook Ltd was formed, which manufactured single and double jersey fabrics from 1970 - 1990s. In 1995 it was sold to Winchester Furniture who ran their business from it until 2004. The building was finally completely demolished in 2006. There was also some mining in and around Higham. Higham Colliery had a shaft from Habergham Colliery, which operated from 1912 to 1930. Fir Trees Drift Mine opened in 1953. It had a workforce of 80. The last coal was mined in 1966. The only evidence of its existence is an electricity pole with the sign Fir Trees Drift S.P. on it. West Close Open Cast Mine operated from 1948 to 1959. 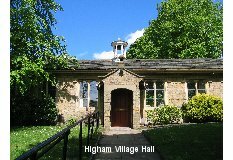 In 2006 Higham has a population of approximately 1000. 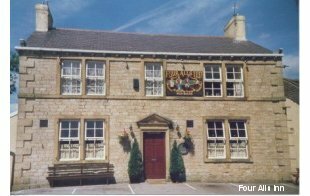 Sixty years ago, there were about 2000 people, but then the boundaries stretched from Padiham to Sabden to Fence (Forest Inn on Cuckstool Lane). There were three clubs, Labour, Liberal and Conservative. The Four Alls Inn opened in 1792. The Priest prays for all. The Soldier fights for all. The Common Man pays for all. The Four Alls was also the headquarters of the Balloon Juice Company, which was a 'club' of locals, who met to drink and talk. The group was run as a company with an AGM and directors. Other businesses included newsagents/,village store, Co-op, Post Office, cobblers, café/grocer, sweet shop, three butchers, blacksmith's, joiner, undertaker and even a baby clinic. In 2006, only the Four Alls Inn and the village shop/Post Office remain. Higham's most famous citizen was Sir Jonas Moore. Sir Jonas Moore was born at Higher Whitelee on 8th February 1617. He became a leading practical mathematician, surveyor, cartographer, Ordnance Officer, courtier and patron of astronomy. He rose from humble origins to be awarded a knighthood, gained membership of the Royal Society and won favour at the court of Charles II. As a mathematician he is best known as the first to use the notation 'cot' (cotangent). He participated as Surveyor in the two most ambitious projects of the age. He was involved with the building of a massive harbour wall, the Mole, at Tangier and also with the draining of the Great Level of the Fens - the Bedford Level, which commenced in 1649. He wrote an account of the work which was printed in 1685 after his death. Oliver Cromwell procured from him a model of a citadel 'to bridle the city of London', and Samuel Pepys was said to possess a copy of his survey of the entire course of the River Thames. Perhaps his most important contribution was his setting up of the Royal Observatory at Greenwich with John Flamsteed, who became the first Astronomer Royal. Moore furnished Flamsteed, at own his private expense, with a seven foot sextant, as well as two clocks, which were used by Flamsteed in his work involved in finding 'longitude'. A recent work describes Moore's contribution to the founding of the Royal Observatory claiming, with much supporting evidence, that he was 'the sole driving force behind the scheme'. Sir Jonas Moore died in 1679 whilst on a journey from Portsmouth to London. There is a small connection with the story of the Pendle Witches - in Alizon Device's confession she told that "anne whittle, alias chattox, was suspected for bewitching the drinke of john moore of higham gentleman" and for causing one of his sons to die. The suspected witches were held at Ashlar House, near Higham. Methodism was very strong in Higham and services were held in private houses until pressure of numbers resulted in the building of a chapel in 1812, which was extended and rebuilt over the years. The impressive Wesleyan Chapel, which stood just off the main street in Higham, was built in 1872 and demolished in 1983. As early as 1816, there was a Methodist School in Chapel Street, which was replaced by the 'old' school and finally by the New School in Sabden Road in 1859, This closed in 1967 and is now 4 dwellings. The National School was built by public subscription in 1837 and used as a school, and also for Church of England services. By 1872 more room was needed so it was decided to build a Church on land adjoining the school. The vendor and guarantor of the acre of land needed for the Church in Higham was Le Gendre Starkie of Huntroyde. The foundation stone was laid on 20th July 1872 . 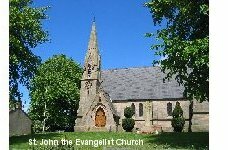 The formal application for a Church dedicated to St. John the Evangelist was made to the Ecclesiastical Commissioners in 1874, and the Church was completed in 1876. The Church was originally a daughter church of St. Leonard's, Padiham, until 2002 when it became a parish church in its own right. The church is now a joint benefice with the neighbouring parish of St. Anne's, Fence. Eventually a new school was built, but the National School (Old School) continued to be used as an infant classroom and dining room, until the late 1970s, when it was purchased to be used as the Village Hall. As the volume of traffic increased, the serious problem of the the busy Barrowford Road running through the village was solved by the construction of a bypass (A 6068), and later the M65. The Four Alls Inn is the only business remaining in the centre of the village. Over the last forty years modern housing has been built on the outskirts of the village. Many of the terraced properties have been renovated and modernised internally. Most of the old farm buildings have been renovated sympathetically and converted into homes. 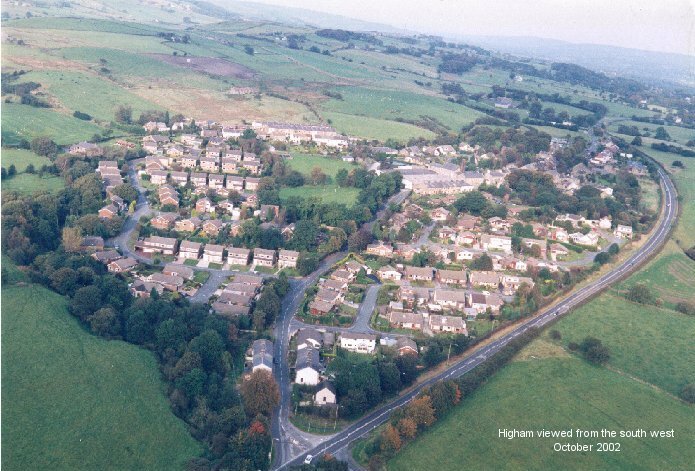 Higham is situated in the midst of the Pendle countyside, and although it has undergone may changes throughout its history, it still retains much of its charm.